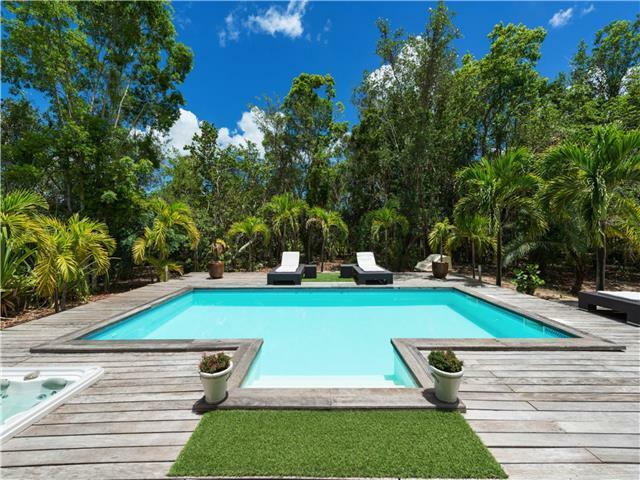 This perfect couple's hideaway, located in the gated enclave of Terres Basses is a one minute walk to the beckoning beauty of Plum Bay beach and affords privacy in a relaxed and peaceful setting. This newly renovated and tastefully decorated cottage is fully air-conditioned, and has a gourmet kitchen and private parking and entryway.There is a generous pool and sundeck with a separate four seat Jacuzzi, all surrounded by well established gardens stocked with a variety of palms and bougainvillea. The newly renovated interior space is air conditioned throughout and comprises a living room, master bedroom with en suite bathroom, a study, a second full bathroom and the kitchen with bar area onto the covered terrace. The third bedroom and bath are located in a separate bungalow accessible from the pool deck.The indoor outdoor casual feel of Monchal makes it the ideal vacation escape for couples and honeymooners. - 3 bedrooms - 3 bathrooms - private pool - jacuzzi - A/C throughout - fully equipped kitchen At Key Caribe we pride ourselves on your satisfaction and you can be rest assured knowing that our accomodations are suitable for a range of people. Our properties are all close to the beach and local tourist's amenities such as bars, restaurants, cultural activities and much more.